Once, when Elsa was surfing the internet, she noticed the Beauty Contest for Princesses. Elsa thinks that she is beautiful and stylish enough to participate and win the contest! She has already sent the apply form for the contest, so it is time to start work on the contest outfit! Help Elsa to create the most magnificent outfit, because she will compete with Ariel, Belle and Aurora, who are also very beautiful princesses. 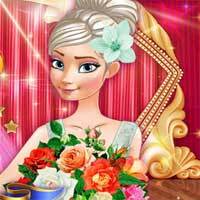 Make sure you chose the most stylish hairstyle, perfect makeup and gorgeous dress! There are many magnificent dresses, so try all of them and choose the best one. When you think, princess is ready, go to the contest with Elsa and win! Good luck and Enjoy!